KIM LAWTON, correspondent: Driving through downtown Port-au-Prince, it’s difficult at first to see much change since we were last here nine months ago. The presidential palace is still in ruins. Thousands are living in a massive tent city across the street, and according to aid officials, more than a million Haitians are still homeless. Around the corner from the palace, people are living in tents on the grounds of the destroyed Roman Catholic cathedral. There, piles of rubble and broken stained glass still fill what was once a beautiful hundred-year-old sanctuary. But despite appearances, faith-based workers who have been active here over the past year insist there has been progress in dealing with this humanitarian catastrophe. NICOLE PETER (Haiti Operations Director, World Vision): The progress is slow, maybe not as quick as other emergencies, but we’re moving forward. LAWTON: Nicole Peter is the Haiti operations director for the Christian group World Vision, which has already spent more than $100 million in post-earthquake work. They’ve been involved in a variety of projects including shelter, water and sanitation, job creation, education, and family support. One example of their work is the Corail displaced persons camp on a windy, flood-prone field outside the capital city. 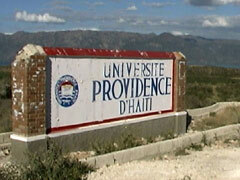 In April, the government of Haiti moved almost 7,000 people to this location about an hour outside Port-au-Prince. But there were no preparations. There were no essential services or infrastructure, so nongovernmental agencies had to step in to help the people. World Vision and other agencies provided sturdy tents to help withstand the elements. Groups brought in latrines and clean water and set up schools. The government still hasn’t developed a long-term housing and resettlement plan for the people here, so World Vision has begun building even sturdier transitional shelters. 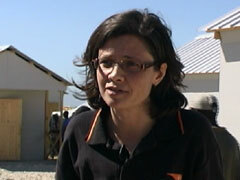 MARY KATE MACISSAC (World Vision): We had to negotiate with donors to convince them that timber frames were necessary. They said that those were perhaps too permanent, but we said no, these people need something strong. LAWTON: The houses are designed to last up to seven years. They can withstand winds up to 100 miles per hour, and in typical Haitian style they all have a front porch. One of the residents, Jeanne, invited me to sit on her front porch with several of the seven children who live here with her. She says she loves this house, and she’s grateful the kids are able to attend school. She says she’d like to get a small business going, so she can feed her children better. Mary Kate MacIssac says there’s been a lot of criticism from the outside media—and even some donors—that more hasn’t been done. She’s also frustrated by the slow pace, but she says people don’t fully understand the realities on the ground. MACISSAC: Haiti was a country that was facing humanitarian crisis even before the earthquake. Then you have a massive earthquake hit an urban center, the capital of a country, and it’s a complexity of urban disaster that agencies have not had to deal with before. LAWTON: Adding to that complexity is a rising cholera epidemic. 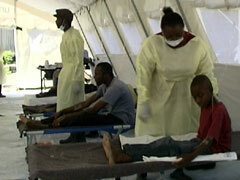 World Vision has set up cholera treatment units near various tent camps. Visitors are disinfected before they enter and when they leave. According to the official numbers, more than 150,000 people have now come down with cholera, and nearly 3,500 have died. Aid groups say the numbers are vastly under-reported. On this morning, 10 people have already been brought in for treatment, including a five-year-old boy who is also being treated for malnutrition. PETER: It’s a new emergency within an emergency, so it’s basically heightening issues that existed previously. LAWTON: Rick Ireland, administrator of the Free Methodist Haiti Inland Mission, is also all too familiar with the complexities here. After the earthquake hit, denominational officials asked him to get to Haiti immediately. The Free Methodist mission had suffered tragic losses. This multistory building on their compound was completely destroyed. The American administrator of the mission, Reverend Jeanne Munos, was killed. Two other American workers and a Haitian staffer also died in the collapse. Ireland had to oversee rubble removal, restore missions operations, and help coordinate relief and reconstruction. REV. RICK IRELAND (Free Methodist Haiti Inland Mission): Everything is just a little bit harder here, and that does get discouraging. LAWTON: The Free Methodists have been working through local churches like this one. Sunday morning services here start at 6 am. Shoe-shine vendors line up out front to help congregants look their Sunday best, while local taxis called “tap-taps” keep bringing more worshipers. With over 2,000 people, it’s standing room only. Ireland says this is the best resource to aid Haiti’s recovery. IRELAND: They knew their community. The pastors, both their church people and the non-church people, were very aware of where the needs were. LAWTON: They’ve been rebuilding churches and schools and training people how to construct something that will withstand any earthquakes in the future. IRELAND: We trained Haitian civil engineers how to build earthquake-resistant buildings, and from that group the Haitian teams went out all over Haiti and did a number of seminars teaching people how to build earthquake-proof buildings. LAWTON: Across from a UN displacement camp is one of those schools. It isn’t quite finished, but enrollment has already doubled from last year. They are also providing clean water for the entire community. LAWTON: One local pastor who has been leading the Free Methodist efforts is Jean-Marc Zamor, who also has a larger vision for Haiti. He took us down bumpy roads heading to a remote location where he wants to build a Christian university that will focus on character and leadership development and train people to work in the public sector. REV. JEAN-MARC ZAMOR: After the earthquake, it’s become more and more difficult to find good professionals, and that’s give me even a higher conviction that this is what we need to do now. We need to train people that will carry on the work. LAWTON: He and a team of other Haitian leaders used their own money to buy 200 acres of land. They’ve hired local workers to begin pouring the foundation of their first building, and they hope to have students by the fall. 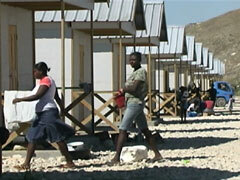 He gets frustrated that many outsiders see all Haitians as needy victims. ZAMOR: There are a lot of people living with cholera, a lot of people in need. But Haiti is not only that. At the same time, there are a lot of people doing a lot of things, a lot of work going on. Otherwise, we would not survive. 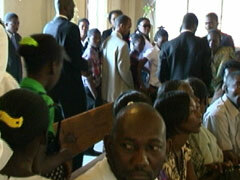 LAWTON: Local leaders are also active in the response of Haiti’s Episcopal Church. Crowded Sunday morning services here are now being held in an open-air structure with a tin roof. 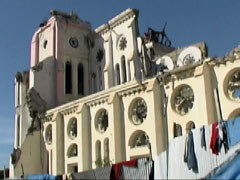 It’s right next to the ruins of the Holy Trinity Episcopal Cathedral, which was completely destroyed in the quake. The church had been known around the world for its magnificent art work. Once a month, the congregation takes a special offering for the reconstruction of the cathedral. 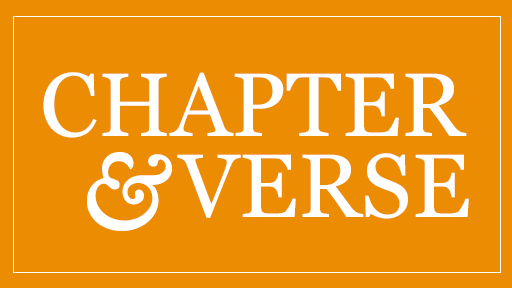 Episcopalians have been active in post-earthquake recovery. I asked the bishop how they will decide whether money should go to helping people or rebuilding the cathedral. BISHOP JEAN-ZACHE DURACIN (Episcopal Diocese of Haiti): It is a symbol. People may think that, people may say, oh, there are so people in tents and we are going to build big cathedral, and so on. No, it is a symbol of faith. It has always been so. LAWTON: And, indeed, for many in this predominantly Christian nation faith has been key to survival. IRELAND: They’re filled with tremendous hope. It’s unbelievable, because it would be so easy just to give up, and they haven’t given up. They really believe that the future can be better. LAWTON: At the Corail camp, World Vision’s Mary Kate MacIssac says she sees hope in the gardens people are planting near their temporary shelters and in the small businesses that are popping up—and in people like Jeanne’s daughter, Diana. She and her sister wrote a song that says despite the earthquake, they will always believe in God. MACISSAC: People who continue to believe in a God that loves them is really quite remarkable. ZAMOR: Haiti is not dying. I think we have taken a lot of time to get started. Once we get started, we will be well on our way, and we will be where we need to be in a couple of years. We are not dying. LAWTON: Given the enormity of the problems that still exist, that hope is likely to continue being tested. BOB ABERNETHY, host: Kim, welcome back. ABERNETHY: How representative, how typical are those people, those hopeful people you talked to? LAWTON: Well, I was surprised to hear anybody even mention the word “hope,” given the enormity of the situation there, but I did hear people wanting to say we are moving forward. Yet no one is suggesting that things are great or things are where they should be. There’s a lot of frustration. A lot of people are tired. And so that is definitely the reality, but within that they are hopeful that they are laying the basis for some real long-term improvement. ABERNETHY: But the general impression I have is that most people here think that these relief efforts, these emergency efforts, are not going very well and that they are taking an awful long time. LAWTON: I kept hearing a lot of frustration in Haiti about that criticism. They are saying look, we’ve been doing so much but the situation has been so complicated. I talked to one relief worker. She’d been in Gaza. She’d been in Iraq. She just came from Afghanistan straight to Haiti, and she said Haiti is a lot more difficult than any of those other places, and people in the outside don’t realize that. They don’t realize the realities they are dealing with and the layer upon layer of complication that make things take time. ABERNETHY: What are the worst problems? LAWTON: Well, obviously the government. There’s been a government in transition. We are awaiting a new election. There’s been political unrest surrounding that. A lot of the international money is tied to the government having a plan, and so the donors from the outside don’t want to give money or legally can’t give the money unless the government has a master plan. Well, if there’s not a good government, a strong government, there’s no government plan, then that money can’t come in and people can’t move forward. That’s one problem. There’s corruption. Haiti was in a bad situation before the earthquake, very little infrastructure, and so all of those things piled together on top of they also had a hurricane and then the cholera epidemic. So it’s just complication upon complication. ABERNETHY: There are two phases—the relief effort, the emergency relief effort which seems to be going on still a year later, and on the other hand long-term development, investment in new jobs and things like that. When are we going to get—when are the Haitians going to get to that second phase? LAWTON: Well, some of it’s happening hand in hand, or the beginning of development is happening even as relief work is going forward. A lot of the Haitians I spoke with want to do it themselves. They want to be able to be self-sustaining, and they believe that for any lasting solution that’s the way it’s going to have to be. But they admit that takes time, and so that’s part of the problem as well. ABERNETHY: Kim Lawton, welcome back.